Magnification, the seminal feature of telescopes, was known as far back as A . D . 1000. A glass sphere called a reading stone was laid on top of the material to be read, magnifying the letters. Salvino D'Armate, an Italian, is credited with inventing the first wearable eyeglasses around 1284, and by the early 1400s eyeglass makers flourished throughout Europe. At that time, the basic similarity between reading lenses and telescopes had not yet been understood. The first generation of astronomers to peer great distances through small, primitive telescopes, and understand that their hands held the key to understanding the cosmos, would not arrive for another two hundred years. Until then, the small, blurry, distant specks in the night sky would remain nothing more than that, even though thinkers for thousands of years had suspected there was more to them than met the eye. With the exception of primitive eyeglasses, the telescope was the first optical instrument constructed, yet its origin is surrounded by controversy. The most likely story places its invention around 1600 in the shop of an obscure Dutch eyeglass maker named Hans Lippershey. According to an often-repeated story, Lippershey's apprentice was playing with two glass lenses that he had shaped and polished for spectacles. By holding one lens close to one eye and the other at arm's length, he inadvertently peered through them in the direction of a distant church steeple. Initially everything was a blur, but the apprentice fiddled with the lenses, changing the distance between them by moving his arm until the image of the church steeple miraculously snapped into focus. Stunned by the sudden clarity of the steeple, the young man stumbled backward by the shock of suddenly seeing it closer than it had been without the lenses. Calling excitedly to his master, the apprentice handed the two lenses to Lippershey, who looked for himself and immediately recognized the significance of the discovery. Hans Lippershey holds one lens in front of another to magnify a distant object. By mounting two lenses in a wooden tube, Lippershey created the first telescope. Unable to sleep that night because of his excitement, Lippershey began building a wooden tube to house the two lenses. Three days later, when he mounted the two lenses about two feet apart inside the tube, he created the first telescope, an instrument that he named a "looker." In 1608, following years of experimentation with improved lenses, tube lengths, and the spacing of the two lenses within the tube, Lippershey sold his looker to the Dutch army. The army's interest was to use the device to spot and estimate the size of an advancing enemy army miles before the enemy spotted the Dutch. News of the invention spread rapidly and other inventors made them. That same year the French ambassador to the Netherlands obtained one for the amusement of King Henry IV, and within the next year, lookers under the name of "Dutch trunks," "perspectives," and "cylinders" were being sold in fashionable shops in Paris, London, and Heidelberg for hunters and sailors. Word of the magical invention spread south to Venice, Italy. There, an unidentified stranger attempted to sell a looker to a politician, who referred the matter to the city's scientific adviser, Paolo Sarpi. Sarpi carefully examined it and questioned the stranger about its workings. But when the stranger mysteriously departed the city with his instrument, Sarpi went to see Galileo Galilei, the city's most respected instrument maker. 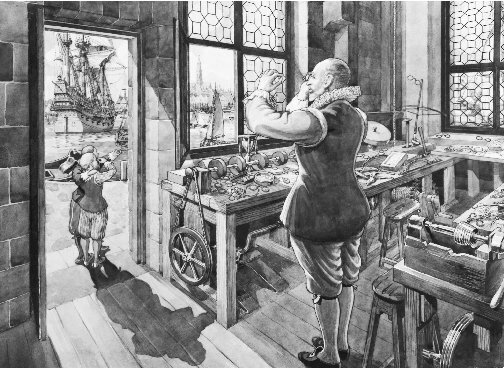 Galileo listened intently to the description of the instrument that could magnify distant buildings, and based on what Sarpi had told him, Galileo set out in his workshop to build one. Galileo is correctly credited with the first use of the telescope for viewing objects in the heavens, but letters between him and friends suggest that he first had other, more pragmatic applications for the telescope. He believed that he could make money selling his telescopes to wealthy Italian princes so that they could use them for military purposes. In Zdenek Kopal's book Telescopes in Space , the author provides two such letters, the first dating from 1609 and the second from 1610. 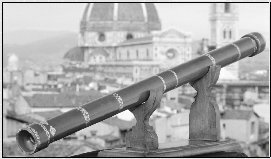 The power of my cannocchiale [telescope] to show distant objects as clearly as if they were near should give us an inestimable advantage in any military action on land or sea. At sea, we shall be able to spot their flags two hours before they can see us; and when we have established the number and type of the enemy craft, we shall be able to decide whether to pursue and engage him in battle, or take flight. Similarly, on land it should be possible from elevated positions to observe the enemy camps and their fortifications. Less than a year later, when Galileo was seeking employment as a mathematician at the palace of the Grand Duke of Tuscany in the city of Florence, he wrote about his telescope: "I have many and most admirable devices; but they could only be put to work by princes because it is they who are able to carry on wars, build and defend fortresses, and for their regal sport make most splendid expenditures." Pictured is a reconstruction of Galileo's telescope. 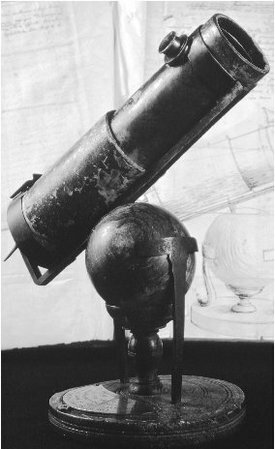 Initially, Galileo believed the telescope would best serve as an instrument of war. sailors at sea, and long-distance signaling. Galileo, however, would soon liberate these early telescopes from their limited terrestrial applications. Galileo's many observations of the solar system led the famous mathematician and astronomer to conclude that the planets revolved around the sun. However, he was not the first to propose such an idea. In 1514, the Polish mathematician Nicolaus Copernicus published a book titled Little Commentary in which he set forth several principles, which he called axioms, concerning the solar system. One of the axioms stated that Earth was not the center of the universe, and a second argued that all the planets including Earth were in motion around the center of the universe near the sun. Although Galileo's acceptance of the Copernican view of the solar system was not revolutionary, it nonetheless attracted the attention of the Catholic Church. Church authorities had cited passages from the Bible that they believed indicated that God had made Earth the center of the universe, with all other bodies revolving around it. As word spread about Galileo's contradiction of church doctrine, Pope Urban VIII summoned him to Rome to express his displeasure. In 1616, Pope Urban ordered Galileo to admit he had erred in supporting the Copernican theory that Earth revolves around the sun. Galileo's refusal to recant created friction between Europe's most famous scientist and the pope. Following years of charges and countercharges, in 1633 Galileo was tried by a church court and found guilty of continuing to promote his theory. He was placed under arrest, yet continued writing while living out the rest of his life under papal confinement. Galileo named his most recently built looker "Old Discoverer" and commented in letters to his friends that it was his best of more than one hundred previous models. Barely three feet long and containing two magnifying lenses, each one inch in diameter, it was capable of magnifying objects twenty-eight times their actual size. The light from distant stars, he explained, was refracted, or bent, as it struck the two lenses magnifying it. Old Discoverer was therefore an early refracting telescope. The historic instrument is now on display at the Institute and Museum of the History of Science in Florence, Italy. In March 1610, Galileo published a description of his night sky observations titled Sidereus Nuncius , Latin for The Starry Messenger . This twenty-four-page book excited scientific thinkers with detailed descriptions of the heavens yet unseen by other scientists. Galileo revealed to his readers the distant scatter of night light to be millions upon millions of stars and colorful swirls of what appeared to be dust (which astronomers now know to be dense gases). In a more general and controversial statement, Galileo challenged the Catholic Church's teachings that Earth was the center of the universe. Agreeing with his predecessor Nicolaus Copernicus, Galileo boldly argued that Earth orbited the sun along with the other planets. Galileo was delighted with his discoveries but disturbed by the sharp criticism he received from the church. Most church leaders believed his observations to be preposterous and blasphemous because they contradicted the church's contention that Earth was the center of the universe—a belief based on the importance of humankind in scripture. Catholic authorities told Galileo that his looker did nothing more than create optical illusions. The church insisted that the images he and other scientists saw could not be trusted. On the night of April 14, 1611, to demonstrate their support for Galileo's controversial discoveries, scientists outside Rome held a banquet in Galileo's honor. Galileo let them peer through Old Discoverer. An unidentified Greek poet happened to be present who proposed that the refracting looker be given the name telescope , a Greek word meaning "to see into the distance." Galileo's dispute with theologians was ongoing and placed him in conflict with them for the remainder of his life. Still, Galileo gave telescopes and astronomy the first major scientific boost. The contemporary astronomer N.M. Swerdlow said of Galileo's astronomical discoveries: "In about two months, December and January [1609–1610], he made more discoveries with his telescope that changed the world than anyone has ever made before or since." 3 The European astronomers who followed Galileo were eager to improve upon his findings and test the abilities of telescopes to explore the universe more thoroughly. 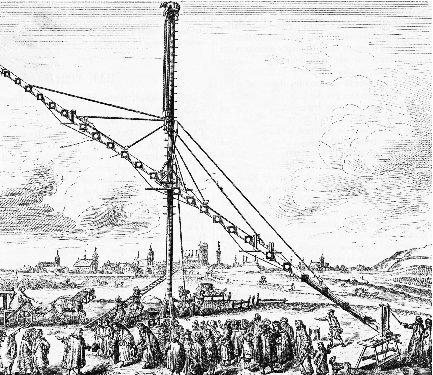 Polish astronomer Hevelius built this telescope that measured 158 feet in length. Although the telescope had great magnifying power, its size made the instrument unwieldy. tube could not be focused at a single point for the observer's eye. An astronomer looking at a distant object saw the object surrounded by what appeared to be a halo of color similar to a circular rainbow. This distracting phenomenon is known to astronomers as chromatic aberration, although its cause was originally unknown. What astronomers did know from trial and error was that the easiest way to reduce chromatic aberration was to flatten the lenses while increasing the space between them, called the focal length. With flatter lenses, all wavelengths of light would focus better at the eye of the observer, and as the focal length increased, so did magnification. The last of these two design changes touched off a competition to see who could build the longest refracting telescope. Although the lenses did not grow much in size (about six to eight inches in diameter), the barrel lengthened to enormous proportions. An astronomer by the name of Hevelius of Danzig provided detailed mappings of the moon using a telescope with an astonishing focal length of 158 feet. The problem with such long, narrow, and unwieldy contrivances was twofold. First, transporting the long, narrow tubes was a major feat, and second, once a location was chosen, setting the barrel sections in a perfectly straight line was almost impossible. In 1663, recognizing that the problem of chromatic aberration was not being completely eliminated by longer and longer refracting telescopes, the Scottish mathematician James Gregory published Optica Promota , in which he described the first practical reflecting telescope (now known as the Gregorian telescope). Rather than using lenses that refract light, his revolutionary contribution was to describe mathematically the capture of light by a mirror that reflected the light to an astronomer's eyepiece. The use of mirrors instead of glass lenses to capture and focus light meant that the tube of the Gregorian telescope could be shorter but of larger diameter than refractor telescopes. Unfortunately, Gregory never built his reflector telescope; that task would fall to the English mathematician Isaac Newton. In 1670, Isaac Newton was a young mathematician studying the mathematics and physics of optics at Cambridge University in England. During his research, he reached the conclusion that visible sunlight was not as simple an entity as his predecessors had supposed. Every scientist since Aristotle had believed that sunlight was a simple, pure phenomenon, but the chromatic aberration in telescope lenses convinced Newton that sunlight required further investigation. As an experiment to determine whether sunlight was a single entity or something more complicated, Newton made a glass prism and placed it on a table in his Cambridge apartment. He then drilled a small hole in the window shutter and closed the shutter to darken the room except for the single beam of sunlight passing through the tiny hole. He then positioned the prism on the table so that a beam of light would pass through the prism and project on the opposite wall. Newton theorized that if sunlight is a composite of many colors, he would see a smear of color on the wall. As he slid the prism into the path of the ray of light and turned to see the result, his answer appeared in a blaze of individual colors stretched out on the wall. Dazzled by what he had discovered, Newton received credit for the revolutionary discovery that sunlight is a mixture of many different wavelengths that are refracted at slightly different angles and that each different wavelength produces a different spectral color. Observing the colorful spectrum of light on the wall, Newton correctly concluded that at the far left of the spectrum, red had the longest wavelength, followed by orange, yellow, green, blue, indigo, and, shortest at the far right, violet. Newton recognized that this was the very same arrangement of colors seen in the spectrum of rainbows and in chromatic aberration. Now knowing that light was refracted into the spectrum, Newton erroneously concluded that telescopes using refracting lenses would always suffer chromatic aberration. He could think of no solution to correct it. As a result, Newton constructed a new type of telescope based on Gregory's Optica Promota that could magnify and focus light by reflecting it rather than refracting it. Isaac Newton invented this telescope that magnified and focused light using mirrors. Also pictured is a manuscript page with Newton's drawing of the telescope. in favor of a concave mirror off of which light reflected to focus and form an image. Newton, following Gregory's design, demonstrated that a concave mirror focuses all wavelengths of sunlight at the same point, thereby avoiding the troublesome chromatic aberration produced by refracting telescopes. Newton's telescope, now on display at the Royal Society in London, was just 12 inches long with a primary mirror 1.5 inches in diameter. Using mirrors solved the problem of excessively long, unwieldy refracting tubes. In addition, the magnification power of Newton's reflective mirror reached 38, making Newton's instrument decidedly more powerful than Galileo's refracting telescope. Contemporary optical engineers estimate that Newton's mirrors reflected little more than 15 percent of the light entering the telescope tube. Nonetheless, his telescope design was a monumental and historic improvement over refracting telescopes. His reflecting telescope not only avoided the problem of chromatic aberration but also focused more accurately and was easily transportable. Best of all, it could see more distant objects than Hevelius's cumbersome contraption. The new reflecting telescope, however, was not without its problems. Having the eyepiece on the side of the barrel was inconvenient for astronomers, and the secondary mirror tilted at its forty-five-degree angle caused some degradation of incoming light. In 1672, the Frenchman Guillaume Cassegrain was reviewing Newton's telescope design and devised a remedy to the tilted secondary mirror and to the side-mounted eyepiece. His solution, which was named after him, continues to be incorporated into the designs of modern reflector telescopes. Cassegrain proposed three significant design changes. First, the secondary mirror should be convex rather than concave. Second, the secondary mirror should be set parallel (face to face) to the primary mirror rather than at a forty-five-degree angle. And third, and most important of all, a small hole should be drilled in the very center of the primary mirror to allow the light ray, as reflected by the secondary mirror, to pass through and reach an astronomer viewing from the tail end of the barrel. With these revolutionary enhancements, entering light is first captured by the primary mirror and focused back on the smaller secondary mirror, which in turn focuses it back through the small center hole in the primary mirror on its way to the astronomer's eye. Using this design, there is less degradation of light and the observer can more handily point the telescope in the direction of observation. Design improvements by Newton and Cassegrain made reflecting telescopes far more valuable to astronomers than refracting telescopes, but they continued to be plagued by poor-quality metal mirrors. Constantly in need of polishing, metal mirrors quickly distorted and corroded. Seventeenth-century astronomers found themselves spending far too much time grinding and polishing instead of stargazing. Some time during the mid-1730s, amateur astronomers frustrated by metal mirrors attacked the problem of chromatic aberration in spite of Newton's pronouncement that no solution was possible. By experimenting with a variety of different types of glass lenses, the Englishman Chester Moor Hall stumbled on a solution. Being an amateur, he contracted with optician George Bass to make two 2.5-inch lenses, one made of crown glass (exceptionally hard and clear with low refraction) and the other a concave lens of flint glass (soft and heavy with high refraction). When Bass combined the two, he discovered that they eliminated chromatic aberration. This combination of lenses was called an achromatic lens. Failing to understand the significance of his discovery, Bass neglected to notify Hall. Then, twenty years later, in the mid-1750s, Bass contacted John Dollond about the achromatic lens. John's son, Peter, saw a commercial application for the lens and applied for a patent. When Hall found out about it, he sued in court but lost because, although he had conceived the idea, he had failed to bring it to fruition. By 1780, hundreds of astronomers snapped up Dollond's lenses, mounted them to refracting telescopes only a few feet long, and saw the stars and planets more clearly than ever. Such an improved refracting telescope did not end the refractor versus reflector debate and competition. What it did resolve, however, as the eighteenth century came to a close, was that telescopes were destined to become larger. you need to tell people the first discoveries of the telescpes i couldnt find anything about that and thats what i really needed to know. THIS KIND OF THECHNOLOGY THEACHING SYSTEM IS VERY NICE THEREFORE KEEP IT UP! I think its amazing that they could even make, while also even polish glass. I don't know how to make glass, and at the moment I'm trying to better understand polishing in an effort to remove scratches from a plastic - a much softer material. How in ever did they find the time to polish these instruments while being limited by the length of the day, while also augment time to do other things like create calculus or relativity is all very amazing to me. who actually invented the telescope hans lippershey or galileo galilei?